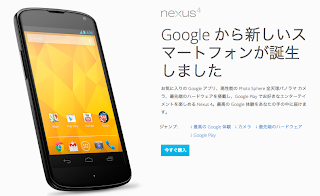 Japan Mobile Tech: Nexus 4 finally released in Japan. So what? Who cares? 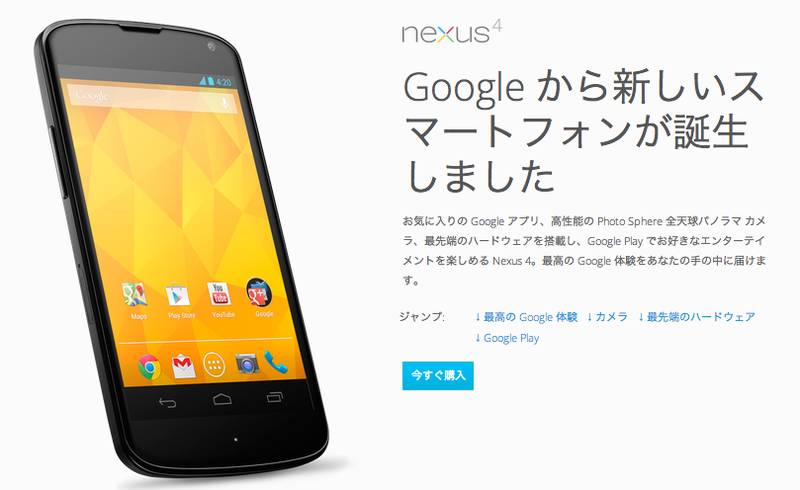 Nexus 4 finally released in Japan. So what? Who cares? I would have bought one of these, probably a year or so ago. My Galaxy Nexus still works just fine, but I have moved over to a Lumia 920. Considering that the price has just *dropped* in the UK this week, I'd recommend importing one from the UK - however strange it may seem! Hopefully future handsets won't take this long to reach Japan. The Nexus 10 is quite a good price, however. As stated in the comments, importing from UK worthwhile if you have the means to do so. While the white model would have been welcome, I'm mostly keen to see how this works on prepaid - usually the handset choice is locked down, as is the choice of carriers but I have seen no announcement of any carrier partnership yet, prepaid or contract. But with respect to price, do you think it still makes sense to pick up the 8GB model at $200 in the US? 8GB is much too small in my opinion. Remember the ROM takes up a few GB of that too. On my 16GB Galaxy S2 I would regularly fill it up with photo's and cached music. I would pay the extra $50 to not have to worry about it as much. 16 GB is too small, compared to what is standard these days. This also has no SD card slot, correct? Yes, I believe it has no SD card slot. Correct, Google has been pretty adamant that their phones won't have SD card slots. So no SD on the Nexus line. Thanks folks for the valuable opinion. I am happily using a GNex for past two years with b-mobile SIM. But the h/w has been acting up lately and I fear that with KLP 5.0 it will be outdated in the coming few months. I did try the S3 alpha for few months, but gave up after facing severe battery issues. It is highly probable that the new Nexus will be released over the coming days, but equally probable that the price points will be much higher than current Nexus 4. So maybe Nexus 4 at $200 can be a compromise while still enjoying newer version of Android for at least another year or so. Storage is not a big issue for me as even in my current GNex, I have 8GB free out of the 13.33 GB available. Most of my stuff is anyway on cloud. Major concern area for me is FOMA usage. Unlike GNex, the Nexus 4 does not have special radio for Japan and supports only 850 MHz. But I am wondering if the band is set to Japan from the service menu, it might be possible for the phone to use some portion of the FOMA frequency. Anyway, it happens that I will be in the US during mid-Sep, so this dilemma!! Else, I would have been happy using my GNex and laughing at people buying the Nexus 4 for 49,000 yen. It's possible, but if you need the FOMA Plus area, then wait until it goes on sale. Someone will surely buy an N4 (ok maybe not ;p) and test it in the FOMA Plus area and peaking around the service menu. Some of those features are largely Japan only things, so I understand why the Nexus 4 wouldn't have them. But it's fairly inexcusable to be double the price than other markets. That just sounds like artificially inflated prices to protect local manufacturers. Why is it so complicated to start selling Nexus phones quickly in Japan? technical certification is not so difficult and clients can get a SIM and plan at Docomo without any problem... so why releasing that model now? As the title says: so what? who cares? What's an MVNO? Does that mean with Docomo you can still get reception in the countryside? If I buy a Nexus 4 in Australia and bring it to Japan, can I just pull the SIM out of my regular Docomo Keitai and start using it? Just an update for Nexus 4 users who bought the phone outside Japan. It is now possible to get it on the FOMA plus network. I successfully did it with the Nexus 4 8GB purchased in the US at end of Aug this year and can confirm that it works great in places where the Galaxy Nexus could not catch a signal with international radio.